The original tactical role-playing game comes from the creators of the Diablo and Ratchet & Clank games. 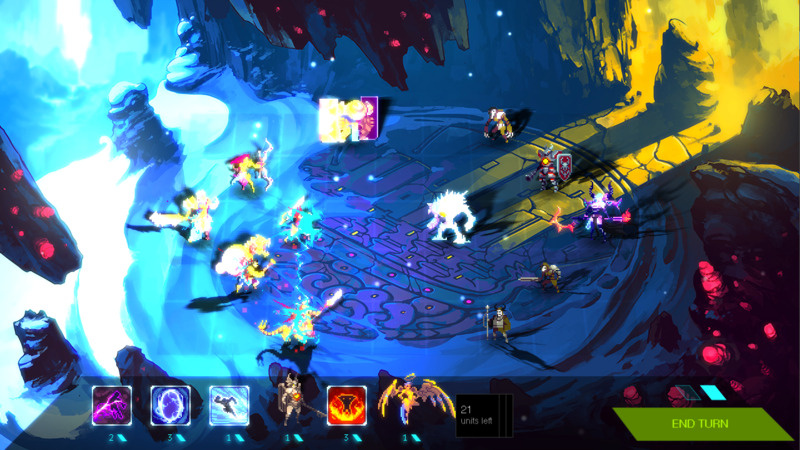 Developer Counterplay Games doubled its Kickstarter goal for its new tactical role-playing game Duelyst. The veteran game developers have built up legions of fans over the years through previous work on the Ratchet & Clank and Diablo game franchises. Duelyst is a turn-based strategy game that features over 100 units and spells from five distinct factions. Players assemble custom squads and engage in ranked multiplayer matches, which opens up endless replay. Keith Lee, CEO of Counterplay Games, talks about what’s in store for mobile and PC gamers in this exclusive interview. What were your goals heading into this project? The big goal for us is we love squad-based tactics games and the innovation that we wanted to do was combine the things that we loved about tactics games with ranked competitive play. So being able to have fantastic matchmaking, the ability to have different competitive tiers to play against people, we wanted to build a really healthy multiplayer social community around squad-based tactical turn-based strategy games. Can you talk about the story? The story of our game is about the world of Duelyst. Every cycle every country chooses a Duelyst that’s able to come in for the grand tournament. It has the same elements of Hunger Games because it’s a futuristic world, but it also has strong elements of fantasy. The idea is for you to build out a squad and fight. And the goal is for you to win these tournaments. How do you feel this game innovates? The biggest innovation is the fact that almost every single tactics game is a single player campaign and it’s tuned in terms of their units and their design to be built that way. There’s a lot of grinding. There’s a lot of leveling up with your units and your characters. The innovation for us is that our focus has always been on multiplayer, being able to do fantastic matchmaking, being able to actually play head-to-head with your friends at any time, and also to play competitively. As I’ve gotten older, it’s harder for me to be able to play a lot of competitive first-person shooters. A much as I like shooters, I want to create some games that are turn-based strategy, but leverage some of the best technology for multiplayer. What do think gamers will like most about Duelyst? Gamers are going to love the fact that it marries all the nostalgic things that we loved about tactical, turn-based strategy. I grew up on Final Fantasy Tactics and the original X-Com. We want to take those ideas and integrate them onto multiplayer and be able to play against other people and really build a thriving community around that, the same way that League of Legends had done for multiplayer. Our game works on the PC, on the Mac, and you’re going to be able to play on mobile and tablets. As long as people are playing on the PC and Nvidia mobile products, our game is always going to be using Nvidia, so we’re pretty excited about that. What has Nvidia provided in terms of technology that’s helped with your development? The big jump for us is the transition to the Tegra K1, which we’re excited by because it opens up new opportunities for using open GL 4.4. What are your thoughts on the new Tegra K1 technology? The Tegra K1 is awesome because we’ve seen how nice it looks. I’ve developed a lot on consoles in the past, having done games on the PS2, PS3 and the Xbox and it’s a significant jump. I think that is comparable to, if not better than, a lot of the consoles that I play today. And the fact that they have OpenGL 4.4 is a huge step for the quality of the rendering on mobile devices and for tablets. What type of leap is there between what you can do with Tegra 4 and what’s possible with Tegra K1? The availability of OpenGL 4.4 and support for Direct X directly and natively is just fantastic for us to port our game to mobile and tablet devices without compromising quality. What are your thoughts on the speed at which Nvidia mobile technology is accelerating? It’s going at a really fast clip. Every six months there’s a new announcement. It makes us really happy that there’s a lot of calibration and normalization for all the different platforms. It saves us a lot of time as a developer not to worry too much about having custom code for every single platform. The great thing is that better processing power allows us to use our custom 3D shaders and not have to worry about the mobile version not looking as good as the PC version. What are some of the challenges when developing for Android devices today? Definitely the big issue is fragmentation. Android devices are getting closer and closer to becoming really nice. The other big problem is that we want to show our games on the browser. We want to be able to show it on the Chrome browser instead of always building something natively. Those are some of the challenges, but it seems that things are consolidating very quickly. How does Nvidia help with this? The great thing with Nvidia is just that it’s a very nice platform to develop on. It’s going to be supported across multiple devices, so them being able to use OpenGL 4.4 is really a huge step for us.